English bulldogs are one of the most fun-loving and lively dogs ever. They are not just kind and gentle and ideal as family companions, but very active and ideal as a playmate, as well. Usually, bulldogs size will be around 40 to 50 pounds. More than this, our very popular dogs known for being cute can also suffer from different health conditions. For all these reasons, English Bulldog pups need all the nutrition they can get, and that includes calories and vitamins among others. In this article, I will walk you through the top five best dog food for your English Bulldog. This food supplement will certainly work best for those that do not just have English bulldogs at home but also with a variety of other dog breeds. 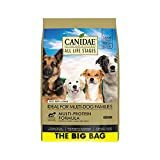 This Canidae product has a one-recipe-serves-all concept of feeding. This means their food supplement is ideal for dogs of across all breeds.This supplement is only infused with high quality and premium substances such as optimum protein which is a match for English bulldogs. Moreover, this supplement is free from wheat, soy and corn which are the top three ingredients that English bulldogs must avoid. They also include a trio of probiotics and omega fatty acids which are necessary to keep your bulldog’s skin and coat healthy. This food supplement is one of the most balanced ones. It is a dog food free from grain, which is a common substance that causes allergy such as rashes among dogs. 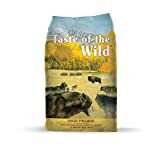 It is also made with authentic roasted meat like lamb to equip your dog with high quality and premium sources of protein needed to keep him active and healthy. Moreover, this food supplement is infused with a variety of fiber sources which are also great sources for complex carbs such as sweet potatoes and peas. These food substances also help in burning fats for the help maintain levels of energy of your dog. Furthermore, for its entire well-being, it is enriched with probiotics and vegetables. This dog supplement is not just free from grain, a common cause of allergies and gluten which is a cause of weight gain. It is also free from chicken. Most people do not usually realize that chicken can be a common cause of allergies. Instead, this product gets it premium protein sources from high quality red lean meat such as lamb. It also comes with superfoods such as vegetables and fruits that offer antioxidant properties for a healthier immune system. Moreover, it contains L-Carnitine, a substance that assists and maintains dog’s fat level and body weight. It is also equipped with two of the most essential fatty acids that helps keep skin and coat healthy. This food supplement is definitely ideal for dogs that are highly active but is also susceptible to gaining weight in an instant. This food supplement also boasts of being free from any soy or wheat. It contains a less fat content but is balanced with a larger amount in protein level. It also contains sources of fiber like brown rice, sweet potatoes, and barley. These food contains complex carbs that are more ampt for your dog as compare to simple carbs. This will equip your dog with energy levels to keep him be active and also helps to regulate his or her digestive system. It is also enriched with Omega 3 and 6 fatty acids which aids in keeping his coat and skin healthy. This dog food is quite different from all the food supplements in this roundup. It is not a dry dog food. It is dehydrated and all have to do to keep you started is to add some water. Since, this is a human gade-based food it does not come with any artificial flavourings or by-products. It is a real food that offers a balanced diet of protein, carbs, and vegetables. Different bre﻿ed﻿s means different nutritional needs for each, as well. It is important that you curate a very specific diet for each of your pup for every breed requires a certain amount of nutrition such as vitamins, protein and fat. For instance, Great Danes and English Bulldogs will require a lower amount of calorie, fat and protein intake. Both of these breeds are in danger or very vulnerable to overweight or gaining too much and can lead to a damage in their bones. Certain breeds are also vulnerable to different conditions. Let us first evaluate the specifics on your English Bulldogs. They are mid sized but really muscular. They are very active but very vulnerable to extreme gain in weight. As stated, English bulldogs’ probably weight is around 40 to 60 pounds. And while Bulldogs may be active, it is imperative that you keep in mind that they are susceptible to extreme weight gain. For this reason, your pup needs to get a decent amount of exercise a day, in order to burn at least 25 to around 30 calories per pound. Moreover, you got to spot the ones with lower fat content. Bulldogs find it a bit hard and difficult to shed and lose some fats once they are inside their systems already. Now, let us go over the specific nutrients your dog will need. Let’s first talk about proteins. According to a study and research done by Association of American Feed Control Officials, the approximate needed amount of protein for English bulldogs is around 22 percent for pups and about 18 percent for adult dogs. For some added information, this demographic can also apply to dogs of other breeds. Next, we will talk about fats. Fatty acids are very nutritious and essential for your dog’s skin and coat. However, too much of these is dangerous for your dog’s health. The ideal amount of your dog’s intake fall between 8% and 15% to be able to maintain and monitor the weight and health of your dog. Next, let’s go over the carbs intake of your dog. This is something you must monitor, at all cost. Too much of this can be especially found sweet foods. Too much of these can make your dog puff out and can lead to certain conditions which we will talk about in the next part.For a general overview, just pay a lot of attention to your dog’s carb intake. Most especially, food with sugars or starches. Look, instead, for food with a higher amount of protein and those with carbs that are slow-burning. This can include sweet potatoes or brown rice. Overall, those are the things you gotta consider before making a purchase. 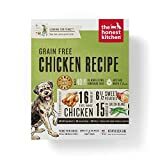 Just as there are certain food your dog needs to have in his diet plan, there are also certain food you need to keep away from his diet plan. Some of these are foods that can make your dogs more susceptible and vulnerable to food allergies. This can include chicken or any other food that contains any preservatives or artificial flavorings. Moreover, you must also keep bone meat away from your dog’s diet plan. Do not mistake this for meat meals, though. Meat meals are good for they contain the necessary protein for your dog. Bone meat, however, is inedible and your dog will not be able to digest this properly in his system. Healthy food intake is one of the major factors that affect our well-being. And this certainly applies to your dog, as well. There are certain health conditions that can be avoided through the proper food and certain conditions you must avoid by avoiding certain food. This condition is most probably the most common one and is characterized by a joint malfunction in their hip. English bulldogs are particularly vulnerable to this condition for they gain weight easily. Their body structures are designed to be near to the ground and thus makes them susceptible to joint and hip conditions. With this type of body structure, there is an underlying amount of load put on their hips and and the knees, as well. To combat this, among others, you have to take note of their daily intake of his food. This will allow ample time for for his entire body to slowly grow and his bones draw near the rest of his body’s growth. Moreover, the one ingredient you have to look for is glucosamine. This ensures the health and well-being of your English bulldog’s joints and bones. Another ingredient that works just as well would be chondroitin. English bulldogs are definitely the gassy bunch. On the surface, this issue may not be a problem at all. But it can actually lead to serious conditions. Best thing to avoid or combat this one is first, give ample spaces in between their meals. This mean more frequent meals but smaller sized ones. Another thing you can do is to avoid giving your dogs food based on soy, wheat, and corn. Moreover, avoid giving them food infused with artificial flavorings, as well. Just like hip and joint problem﻿s, this one is also a common issue among bulldogs. English bulldogs are particularly susceptible to this condition during the summer. It is vital that they get a great amount of water per day. Not having so will leave to severe problems especially with regards to breathing. This one is fairly simple. All you gotta do is look for dog food that is infused with a substance called beta-carotene. And the winner for this round is Earthborn Holistic Great Plains Dry Dog Food. It is not just free from grains or gluten which cause allergies and weight gain, respectively. It also gets its protein sources from premium red meat and does not contain chicken, a common allergen. It also contains superfoods which help keep immune system healthy. Moreover, it is infused with Omega fatty acids that help in keeping skin healthy and lastly, it contains L-Carnitine which is a substance that helps maintain body weight of dogs.